It was ladies’ night in Santa Barbara, and they all came out to dance! Elizabeth Banks and Diane Lane were in town to fete their friend Jane Fonda. 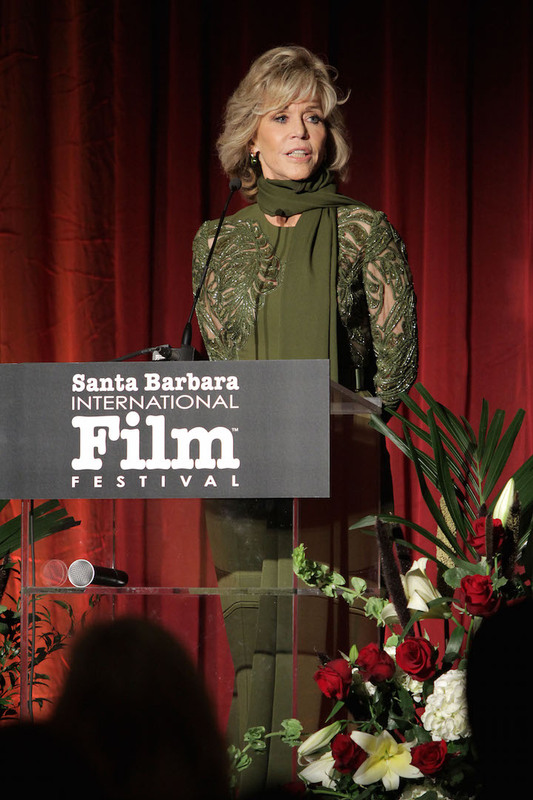 The Santa Barbara International Film Festival and its Director Roger Durling honored Jane Fonda with their 10th annual Kirk Douglas Award for Excellence in Film at a gala event held at the Bacara Resort & Spa in Santa Barbara. The event kicked off with a pre-reception and red carpet held in the courtyard, where guests mingled and sipped Altos del Plata wines. Following Elizabeth Banks and Diane Lane, Jane Fonda danced onto the red carpet looking stunning in a green Elie Saab jumpsuit. After dinner, Hennessy’s Paradis Imperial cognac was distributed for a toast. Following the toast, Elizabeth Banks took the stage to thank Jane for her art, activism, and inspiration, calling her a “walking celebration of feminity and power”. Banks also cited that while she had watched a reel including all of Fonda’s films, she was not embarrassed to say that 9 to 5, which she watched as a seven year old, was her favorite. It made her dream of being a BOSS like Judy Bernly. Diane Lane shortly followed to present the award to Jane. Saying she was here out of a sincere love for her, Diane thanked her for being the woman who has informed everyone’s love with courage and honesty. This evening of female empowerment concluded with Jane’s acceptance of the award. She thanked everyone in attendance as well as Kirk Douglas who had submitted a taped message for Jane that played earlier in the evening. Jane also thanked the Santa Barbara International Film Festival, and as an activist herself, lauded the festival for its many year-round charitable programs.